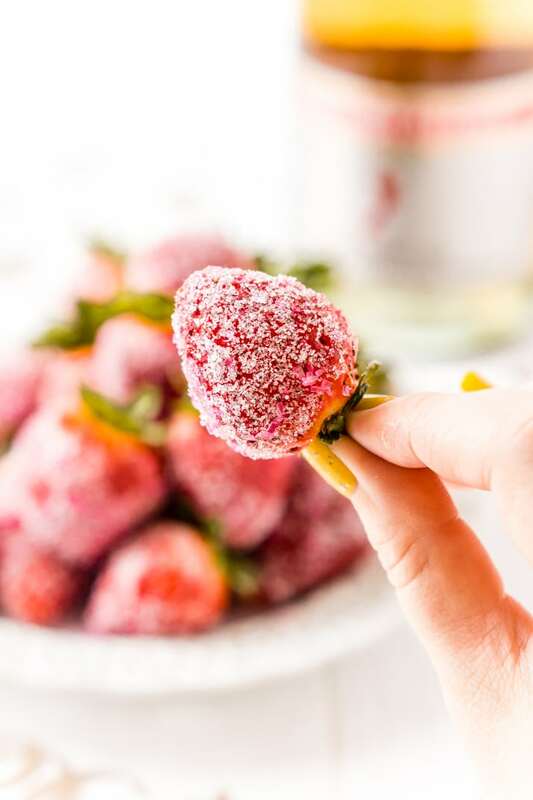 These Moscato Strawberries are a simple 3-ingredient recipe made with pink Moscato champagne, fresh juicy strawberries, and sugar! An easy dessert for NYE, Oscar parties, Valentine’s Day, Bridal Showers, and more! You’re probably wondering why the heck I’m sharing these Moscato Strawberries a week after Valentine’s Day and two months since NYE, well, that’s because the most glamorous night of the year is still to come. The Oscars! In the past, I did several recipes that were inspired by the nominated films like these Billionaire Bars and Cajun Chicken Skewers, but this year, I’m not feeling many of the films and decided to keep things simple. And by simple we’re talking all of three ingredients for this recipe, that’s right, just THREE, and it’s so easy to make too! These are a super fun and tasty treat to serve up at any party, great for bridal showers too! 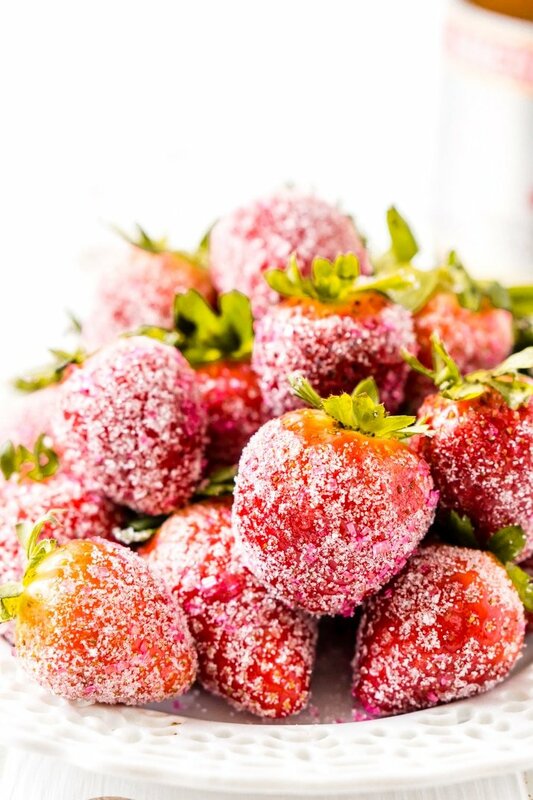 The strawberries are soaked in pink Moscato champagne and then dipped in sugar for a boozy burst of berry flavor everyone will love! If you do decide to serve these at an Oscar party, don’t forget the Oscar Confetti for your table! We’ve never really hosted an Oscar party, but Oscar season is one of our favorite traditions. For the last six or seven years, we’ve aimed to watch all of the Oscar-nominated films and then fill out our printable ballots. Whoever wins usually gets something like a foot rub or not having to make dinner the next night. But mostly, bragging rights. This year it has been hard to get excited, I’ve really enjoyed some of the movies, but some of them could not end soon enough. But we’ll power through the last couple we have to watch and hope that next year will deliver a strong round of films. But in the meantime, I have these delicious Moscato Strawberries to cheer me up! I love how easy this recipe is to make and how yummy it is too! More great Oscar Party Ideas! 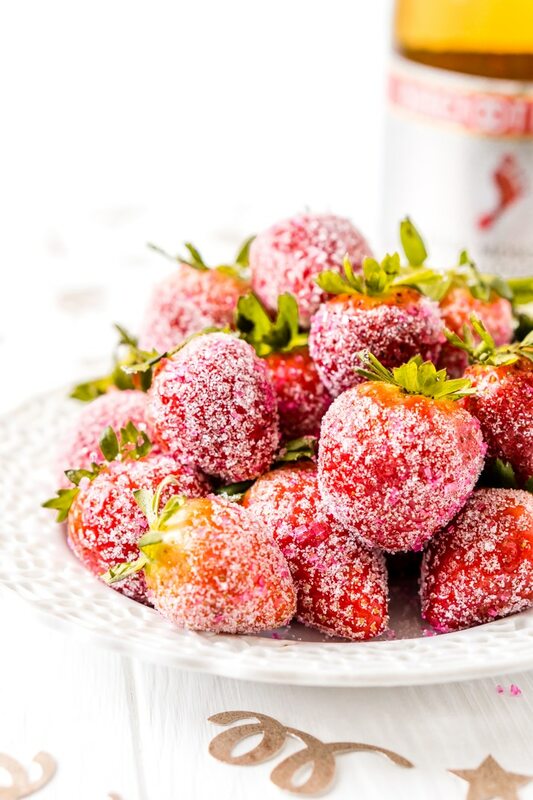 These Moscato Strawberries are a simple 3-ingredient recipe made with pink Moscato champagne, fresh juicy strawberries, and sugar! An easy dessert for NYE, Oscar parties, Valentine's Day, Bridal Showers, and more! 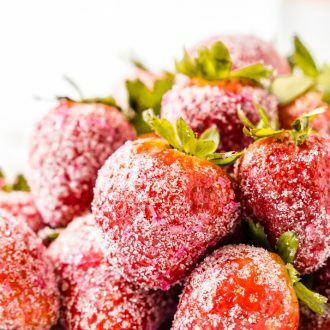 Add clean strawberries and Moscato to a large bowl and allow to soak for one hour. 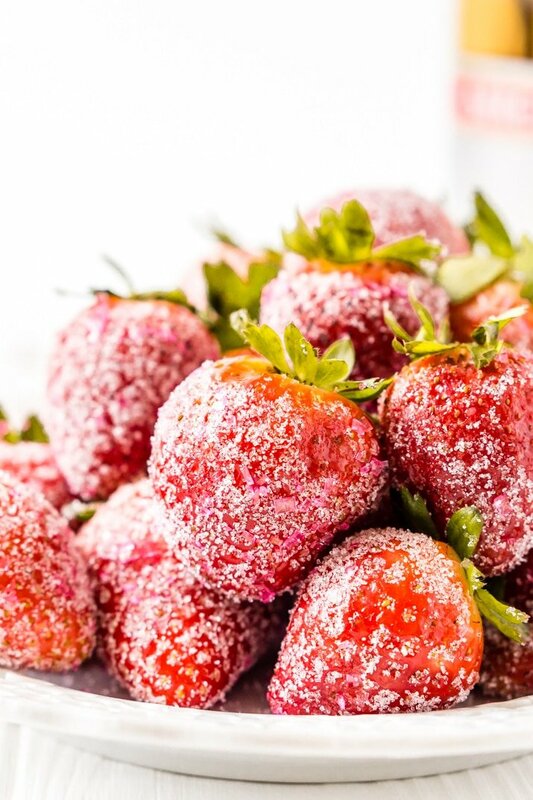 Drain the strawberries and pat them dry and roll them in sugar. Enjoy immediately. Ooh I’ve never thought to prepare strawberries like this, but it’s SUCH a fun idea and perfect for a glamorous awards show party! My Italian parents always loved their fruit macerated in wine. Now, I’ve had grapes in wine but I haven’t tried the strawberries. Luckily it’s strawberry season now and I will pick up some wine. YUM!! 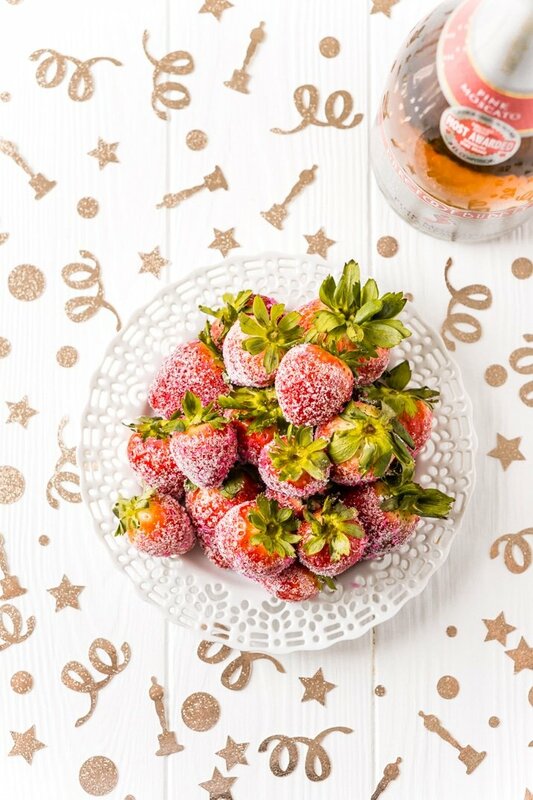 These strawberries are so festive and beautiful! to be enjoyed all year long, but yeah perfect for the oscars!